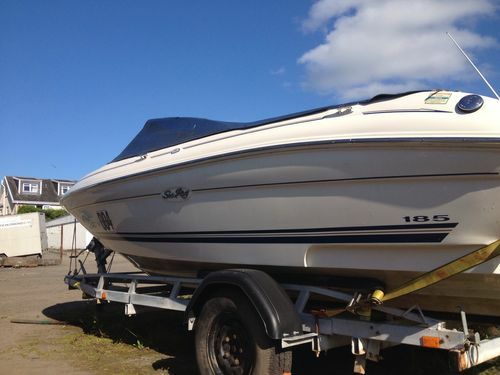 Searay185 bowrider,2001, great condition, very rare 4.3EFI Mercruiser engine recently serviced, only 290hrs from new. Comes along with trailer, high five propeller for maximum performance, tonneau cover and bimini cover which slots into rear compartment, rear swim ladder, ski-locker, factory fitted depth gauge, stereo, drink cooler compartment. The boat is carpeted throughout and the back seats can convert into a sundeck. This engine is a rare factory option which has better fuel economy and greater horsepower, all manuals and original documentation supplied. Great boat and be very sorry to see it go, more pictures available on request. Advertised elsewhere also and cash on collection, happy biding! Any questions please call 07785512032.